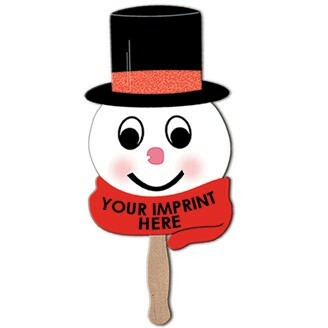 Snowman fan with top hat on a stick, made from heavy high density, white paper board, liquid laminated for a high gloss finish. Includes preprinted stock graphics. Large imprint area to display your custom message or logo. Makes a unique holiday promotional item for school, company parties, churches and more. Custom imprint in black. Imprint Area : 6" W X 1 3/4" H.